へようこそ！ Apartments Garsparina Village Castelnuovo del Garda. 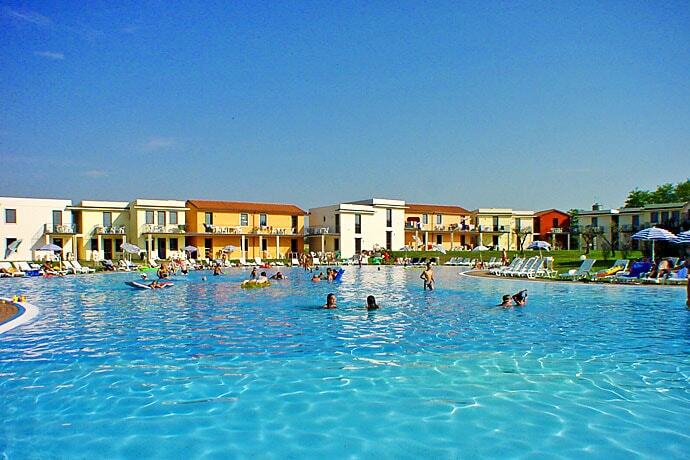 The new build up Apartments Gasparina Village, situated in Castelnuovo del Garda, is only 2 km away from the centre of Peschiera del Garda and and very near Gardaland amusement park, Caneva World aswell as the other parks. Apartments Gasparina Village consists of two floored apartments and three-room holiday homes which are built around a pool/lagoon area. Inside you will find a kitchen/living area with a sofa bed, a bedroom with a double bed, a bedroom with two single beds, a bathroom with shower, テレビ, 空調, 安全, a balcony or a small garden with garden furniture. Next to our Restaurant/Pizzeria there is a mini-market, バー, sports facilities, 子供用のプレイエリア, ランドリー, パーキング. The village has a sport centre with football field, children playground and a large lagoon swimming pool, healthy program, ミニマーケット, レストラン, bar and parking only for its guests. Animation program during the high season and your little ones can join the children club too. Possibility of half board. (Apartments Gasparina Village Castelnuovo del Garda apartments residence).